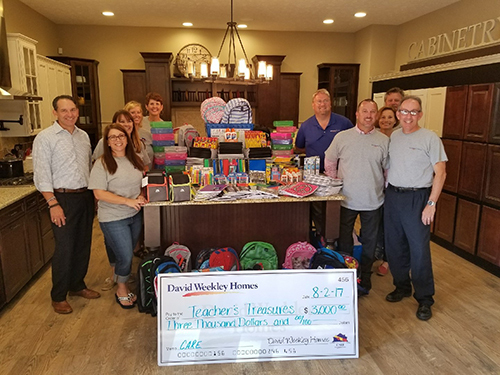 Indianapolis, IN (August 15, 2017): David Weekley Homes hosted its third companywide CARE School Supplies Drive in 18 cities across the country. In Indianapolis, school supplies were collected for Teachers’ Treasures, an organization that obtains and distributes school supplies to teachers in Marion County and surrounding school districts to provide to students in need. Nearly $1,000 in supplies were collected from homeowners, homebuyers, Real Estate Agents, business partners and vendors during the drive, which benefitted 10,000 children. In addition, a $3,000 donation was given to help purchase additional school supplies, which means the total collection will impact every school in Marion County. After collecting the donations, 45 team members volunteered to sort the supplies and deliver them to the organization to ensure the supplies would be distributed in time for the students to begin school with the tools needed to be successful. David Weekley Team Members donated school supplies to Teachers’ Treasures.